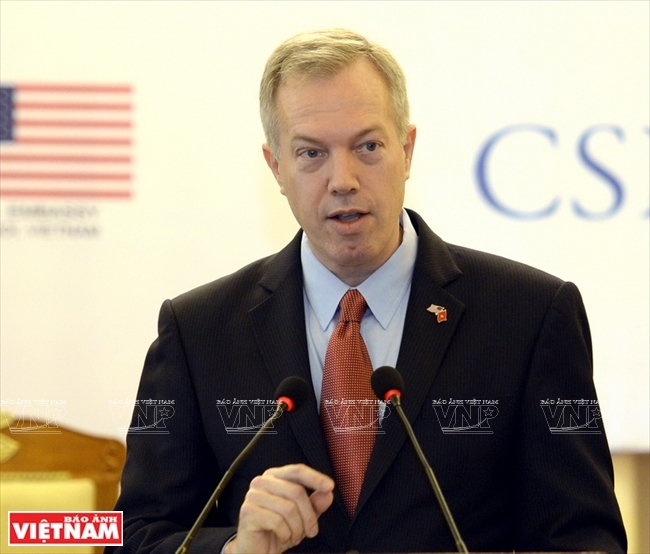 US Ambassador to Vietnam Ted Osius is friendly, proficient in Vietnamese and exerts himself to the utmost for a better relationship between Vietnam and the United States of America. He gives good feelings and fine impressions to the Vietnamese people. Before leaving for Vietnam to take up the post, Ambassador Ted Osius opened his heart on his personal Facebook page, “President Obama’s decision to appoint me to be the new US Ambassador to Vietnam has made my dream come true”. Such a “dream” materialised for Ambassador Osius through his great efforts in promoting the development of a bilateral relationship to the level of comprehensive partnership, the successful persuasion of the US Government to lift the conventional weapon embargo on Vietnam and to support Vietnam in the course of successful TPP negotiations. He was also a key figure in General Secretary Nguyen Phu Trong’s successful historic visit to the United States at the invitation of US President Barack Obama. 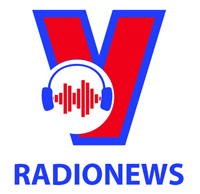 Speaking of the Vietnam - US relationship, Ambassador Osius affirmed that never before have the bilateral relations developed so well and will continue to develop in the future. Some advancements that have been made are politics-diplomacy, economics-commerce, science-technology, medicine-environment and education. Ambassador Ted Osius attends the scientific seminar on Vietnam - Unitied States comprehensive cooperation. Ambassador Ted Osius is a career diplomat of the US. Before being appointed to be Ambassador to Vietnam, he undertook various important diplomatic positions, such as Deputy chief of mission at the us embassy in Indonesia; Political minister- Counsellor at the US Embassy in New Delhi, India; Deputy Director of the Office of Korean affairs at the state department; and Senior Advisor on International Affairs at the Office of the US Vice President. Ambassador Osius not only does his best to boost bilateral ties but also demonstrates the image of a diplomat who is friendly, open-hearted and knowledgeable about Vietnamese culture and customs. On the occasion of At Mui Tet (2015), the first lunar New Year festival he enjoyed in Vietnam in his capacity as an ambassador, Ted Osius created a fine image with a clip “Xin Chao Viet Nam!” (Hello Vietnam) on Face-book page to share his impressions on Vietnamese Tet. On the day of “Tet Ong Cong Ong Tao” (December 23 of the lunar calendar when the Kitchen Gods are sent off to Heaven to report on happenings during the old year), Ambassador Osius and his family went to West Lake to release carp to see off the Kitchen Gods like other Vietnamese families in Hanoi. More surprisingly, he was seen going shopping in preparation for Tet and making Chung cakes. 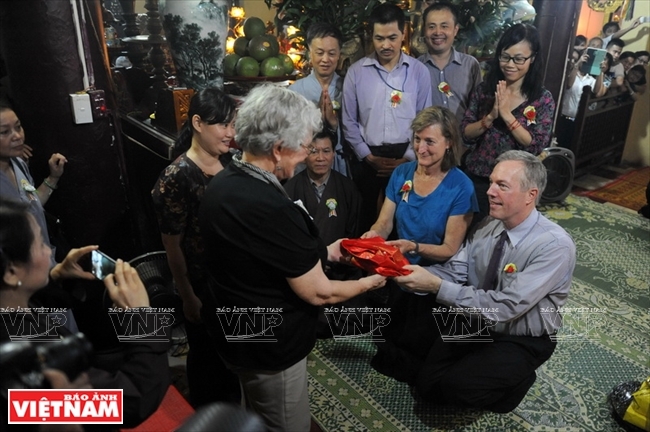 These deeds show that he not only understands but also respects the Vietnamese traditional culture. 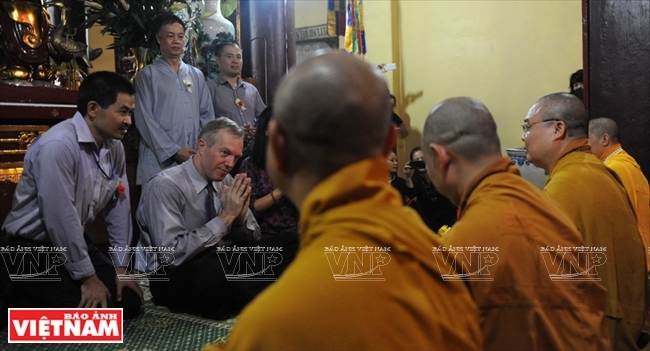 Ambassador Osius also often attends many big traditional cultural festivals of the Vietnamese people. Under a torrential rain of July 15 of the lunar calendar, he was seen going together with his family to Quan Su Pagoda (Hanoi) to attend Vu Lan (Ullambana) celebration, a Vietnamese rite organised to remember the lost souls. Recently, on Vietnamese Teachers’ Day, November 20, he and his family burned incense at Van Mieu-Quoc Tu Giam, (the temple of literature and the First university of Vietnam), where he recalled President Ho Chi Minh’s famous saying: “For the interests of ten years, we plant trees, for the interests of hundred years, we plant humans”. Ambassador Osius participated in many social activities, like motorbike rides to campaign for wearing helmets, riding bicycles for the environment and volunteering in blood drives. He was involved in cross country bicycle rides, visiting rice fields and talking to peasants. These things have made the Vietnamese people see him as a special ambassador. 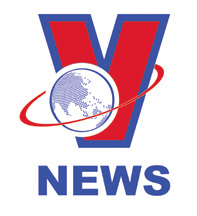 Therefore, after only one year in office, the images of Ambassador Osius have been familiar and regularly seen in the Vietnamese press. They are the images of an Ambassador who strives for the common development of both countries - Vietnam and the US.